"Obama's Iran nuclear deal was fatally flawed from the beginning," Cruz told the Free Beacon. "The deal required reckless international concessions and incentivized the international community to turn a blind eye to Iranian bad behavior. These proposed European ‘fixes' don't address the missiles Iran would actually build, the inspection problems that would actually arise, or the eventual sunsets as they would actually occur. They would only constrain the Iranians from doing things they never would have done. President Trump should reject these empty promises and withdraw America from this disastrous deal." In addition to the relaxed restrictions of Iran's missile program, European leaders and Iran deal supporters are urging the president to accept a basket of so-called fixes to the deal that Iran deal experts and administration insiders say falls far short of President Trump's original demands. This reversal in the negotiating position of the United States could result in Trump deciding to wholly abandon the nuclear deal. French president Emmanuel Macron, in town this week for his first official meeting with Trump at the White House, is expected to pressure the president to remain in the deal and give in to European demands that Iran be permitted to engage in multimillion-dollar business deals across the region. European officials have echoed these concessions, including the relaxation of restrictions on Iran's missile program, for weeks, worrying administration insiders that Trump may cave despite his tough rhetoric. European officials, on a recent trip to Washington, D.C., are said to have attended a dinner party where they met with former Obama administration officials and Iran deal supporters to figure out ways to preserve the accord and not give in to Trump's demands, according to sources familiar with the ongoing talks. "When political directors [from European allied countries] came to town, they huddled with the deal's supporters, another sign they're just looking to preserve the JCPOA," said one veteran foreign policy adviser apprised of the situation. There also has been little change in the U.S. negotiating team and its stance since former secretary of state Rex Tillerson was fired by Trump for failing to carry out his hardline stance on reforming the Iran deal, sources said. U.S. officials confirmed to the Free Beacon in recent weeks that the negotiating team has not changed personnel since Tillerson's exit, a disclosure that opponents of the deal have found troubling. "The Tillerson-McMaster negotiating team is carrying water for the Europeans," said one administration insider with knowledge of the nuclear talks, referring to H.R. McMaster, the recently fired national security adviser who also was viewed as going along with European concessions on Iran's nuclear program. "They have nothing real to show after months of negotiations," the source said. "The idea that they are even close to ‘fixing' the JCPOA is farcical." Among the sticking points in these talks are efforts to fully restrict Iran's ballistic missile program, which has been endorsed by many in Congress, as well as by Trump. Rather than focus on the totality of Iran's program, U.S. and European officials are choosing to focus only on Iran's long-range stockpile. Officials are pushing for a cap on Iran's missiles that would keep them below a range of around 1,240 miles. This distance is the same one embraced by Iranian supreme leader Ali Khamenei when he issued a 2017 edict on the country's missile program. A State Department official confirmed to the Free Beacon that Iran's long-range capabilities are currently up for discussion. The official would not comment specifically on whether distances would be capped in line with the ayatollah's demand. "We have discussed the areas the president identified in January where he wants to see improvements—including ensuring Iran never comes close to developing a nuclear weapon and addressing our concerns with the sunset dates, taking strong action if Iran refuses IAEA [International Atomic Energy Agency] inspections, and preventing Iran from developing or testing a long-range ballistic missile," the official said. The Trump administration maintains the United States will walk away from the deal if negotiations fail to produce an acceptable agreement by May. "This is a last chance," the official said. "In the absence of a commitment from our European allies to work with us to fix the deal's flaws, the United States will not again waive sanctions in order to stay in the Iran nuclear deal. And if at any time the president judges that agreement is not within reach, the United States will withdraw from the deal immediately." Recent moves to align the United States more closely with Iran's position has roiled White House allies and congressional officials, as well as hawks in the Jewish community who believed Trump would finally crackdown on Iran's repeated threats to destroy the Jewish state. "I honestly don't know how the president can sell Israel down the river like that," said one Jewish official who routinely engaged with the White House on Iran issues. "It's bad enough they're trying to deal with missile threats to their north alone. 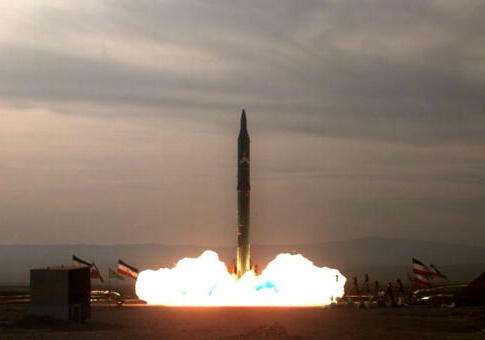 Now Iran gets a green light to perfect missiles that will one day constitute an existential threat to Israel's existence?" Richard Goldberg, a former top aide to Sen. Mark Kirk (R., Ill.) who currently advises the Foundation for Defense of Democracies, told the Free Beacon that the only acceptable fix to Iran's missile program is a complete blanket ban. "A true fix on missiles should align with the Roskam-Cheney bill in the House—total snapback of all sanctions if Iran develops or tests any nuclear capable ballistic missile, period," Goldberg said, referring to current legislation that would fully outlaw Iran's missile program. "That's the gold standard. That's what the Security Council calls for. Otherwise you're just negotiating a bad missile deal to supplement a bad nuclear deal." Josh Block, a longtime foreign policy professional who serves as the CEO and president of The Israel Project, told the Free Beacon that by only focusing on Iran's long-range missile capability, the Trump administration is leaving Israel open to attack. "We know that the mullah regime already has the capability to strike targets up to 1,240 miles from Iran's borders—a range sufficient to hit the State of Israel, our Arab allies across the region, every U.S. military installation and American soldier in the region, and even parts of Europe," said Block, a former Clinton administration official. "Iran's new ballistic missile cap offer is a total sham—one cooked-up by Iran's allies in Russia, who are already supporting Tehran and Assad's violent war to dominate the Middle East—designed to fool President Trump, with the support of greedy Europeans who care more about making money," Block said. This entry was posted in Issues and tagged Iran, Iran Nuclear Deal, Israel, Trump Administration. Bookmark the permalink.